Are you looking for a faster way to download a file at an incredible speed on your Android phone? if your answer is yes, then you are at the right place. There is nothing annoying than trying to download a large file on your android phone and the download seems too slow or even breaking without resuming. However, the download manager for Android is not the first thing that comes to mind when you’ve got a brand new Android device. But, if you are the type that downloads a lot of stuff, you will find it very crucial and necessary. While most of us use a download manager software like IDM on their PCs, we generally tend to ignore them on our Android devices. However, most people don’t have the idea that downloading on a mobile phone like Android are much faster and the chances of failure are very minimal. Conversely, when you compare, this with the speed and the resume capability of both download manager on PC and Android. 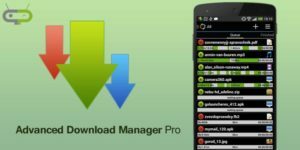 Lets delve quickly into the various download managers that are quite popular on the android platform. 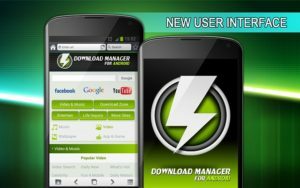 Advanced Download Manager apk (ADM), is one of the most popular download managers apps and also available on the Android Play Store. The app is capable of downloading up to 3 files simultaneously. The download speed gets its increased speed using multi-threading and directly intercepts links from stock browsers, like Chrome, Opera and Web browsers. It accelerates downloads by splitting files into multiple sections and downloading them simultaneously, and therefore speed up the download process. Additionally, it can also resume broken downloads so you don’t have to start downloading from the beginning. The app also has some good automation features. You can also choose to download files only over Wi-Fi and also have parallel downloads of files in a queue. The app can easily download files larger than 2 gigabytes, which is great. Considering it’s a really small app. 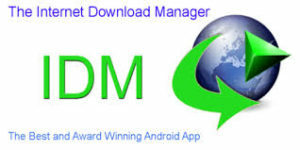 Download Manager, as the name suggests, keeps things simple with focus only on downloading features. it known to increase download speeds up to 3 times than stock download.You can easily download files by adding links in the app and it can download all kinds of files, music, videos, photos, HTML, and software etc. even with sizes of over 2 gigabytes. The app is also capable of automatically detecting links from your browser. Wow, this crazy ehh why don’t you give it a try. The interface of the app simple and considered modern but the developer has made sure to keep things simple. The app lets you change the total number of parallel downloads up to a maximum of 10 and the buffer size to optimize downloads. If you want a no-nonsense download manager without complications, you should definitely consider this one. – Run in background to you can perform other activities on your device. – Several files may be downloaded simultaneously or in queue. – Get your files from the Internet like videos, music, photos, software and documents office to use them offline. – It offers the option to manually add links. – It’s possible to select the buffer size to optimize the data transfer. – Provide the option to enable or disable the notification in the status bar. – Optimized support: Gingerbread, Ice Cream Sandwich, Jelly Bean, KitKat, Lollipop, Marshmallow, and Nougat. Turbo Download Manager is another app that can substantially increase your download speed, whilst also manage multiple downloads tabs. The app is reported to increase download speeds by around 5 times, which is not very realistic in our opinion but the app does boost download speeds by increasing the number of connections or threads. The interface of the app is fairly simple and easy to use and it lets you download multiple files at the same time, retrieve links from browsers directly, optimize buffer size rate, pause/resume downloads anytime and more. On devices running Android 5.0 or higher, files can also be saved directly to the SD card. 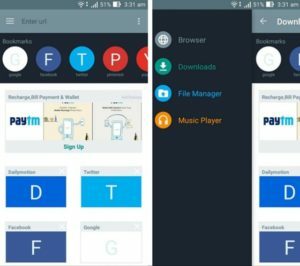 Download Manager for Android or Downloader, as it is popularly called, has over 10 million downloads on the Play Store, that shows how popular it is among users. 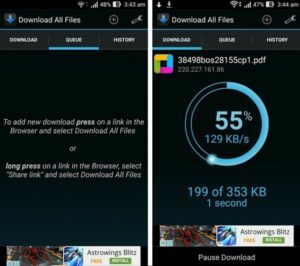 The app is capable of downloading different file types like APK, RAR, ZIP, MP3, DOC, XLS etc, it can download 3 times faster than regular downloader. 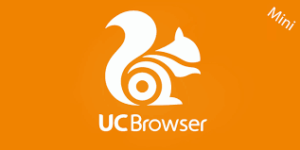 The app includes its own web browser, which functions like any other web browser just like the UC Browser and makes the whole process a lot simpler. You can simply look for files using the built-in browser or enter the download link if you have one. The app supports multiple parallel downloads at the same time too. Apart from being a download manager, it is also a file manager and music player built in. So, if you want an app that manages your downloads, while also letting you open downloaded files right in the app, this one should suit you well. Download accelerator plus is also one of the best Android download managers. It offers the support of all file types such as video, music, documents, and so much more. The possibilities of downloading content on Android becomes endless with download accelerator plus. That brings us to the end of our list. it will be crazy to have all the Android Download manager on your phone but however, you can choose the one that you resonate with and make it your downloader or even download them one after the other to test the one will like to use. So, save yourself the struggles of unreliable downloads and let a download manager take care of things for you. After all, you must have a lot else to do, right?